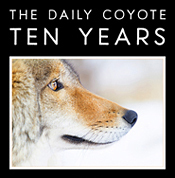 The Daily Coyote » Blog Archive » A Book & A Birthday! A Book & A Birthday! Ooooooooh Shreve…this little video is absolutely beautiful, makes me cry and smile at the same time. Happy Birthday to you and Charlie, all the very, very best, and may you have many more wonderful years together. I am so thrilled, can hardly wait. He’s so beautiful and so is everything else about this project. Love, love, love. And crying at my desk. super excited! and yea, you made me cry at work LOL so many sweet pictures! Ordered my copy. I can’t wait! Your writing is so descriptive and soulful; it’s like Charlie lives with me, too. Yes, tears. What a decade it’s been—- happy birthday to you two creatures!!! Your photos of Charlie & farmily have started my daily computer routine for so many years now. I’m glad I get the chance to support your work by pre-ordering this loving tribute. Here’s wishing for the greatest success with your book Shreve. Oh Shreve – how beautiful. The video is so touching. I ordered my 3 books… super excited, as always, to be a part of every project you undertake. This one though – what a brilliant way to capture the last decade. I love the process you’re using to do the book. Perfect for us, your extended family. I ordered a copy for myself as well as my mom! The photos you take are amazing! I am already counting the days until the book arrives. This is the very first blog I check everyday (and has been from almost the very beginning). I cried – it’s been a wonderful 10 years following you with Charlie and friends. I look forward to the coffee table book! BEAUTIFUL. What does Producer Credit mean in this context and therefore why does the price jump from $88 to $500? How thrilling! You, Charlie and farmily have been a beautiful part of my life for nearly ten years now, and I thank you for that. What a journey, and how generous of you to include us. The book is glorious; I can’t wait to see it. It’s clear from the video and snippets you’ve shared that the words and images will be spectacular. Congrats in advance for this amazing accomplishment! Yes, tears. Lump in throat! Your love for him and his for you….well now I also need a winter coat to put on for the chills it gave me!! Soooo beautiful and precious…. no, i didn’t cry. ~looks around… why is everybody crying? Oh Shreve! The opportunity you’ve had to share in Charlie’s life, the connection you have with him – it’s so uplifting! Yes, the video touched me immensely. Happy Birthday Charlie! Ordering my book ASAP! Thank you for sharing Charlie with us. I ordered a signed copy of the book, Shreve. I can’t imagine with all of your followers that you won’t be able to publish your book…that would be a sad day in my life. I love Charlie, I chose to get daily pictures, he always puts a smile on my face no matter how I’m feeling and the pictures of Charlie trying to fit every toy in his mouth always has me laughing. I can’t believe 10 yrs. have gone by…Charlie has grown to be so beautiful and some of the scenery he stands in front of is just gorgeous. You’ve made yourself a good life out there in Wyoming and I’m envious. I wish I had just a little of your courage. Happy Birthdays and Hugs to both Charlie and you. Yes, I cried ~ as soon as I saw Eli. Otherwise too filled with joy and awe for tears. I can’t imagine you won’t get enough orders to go to print. I’ve ordered 3 copies ~ a signed one for me and 2 more to give as gifts. I wish I could order more! Thank you, Shreve, so much for sharing Charlie with us. Please give him extra birthday hugs and kisses from me! you’ve been my sunrise and sunset for 10 yrs.——happy birthday to you both—–can’t wait to get the book!! Happy 10th Birthday, Charlie! May your day be filled with as much joy as you bring to my days each time I open up The Daily Coyote picture! God bless, you, Shreve & the entire family! Have fun! Love you all! PS I ordered my signed copy — can’t wait for its arrival! Thank you, Shreve, Charlie & the entire farmily! (I stop everything I’m doing and look forward to that moment each morning when I set all my cares aside and take a quiet moment to open my daily picture of Charlie — he always starts my day off on a positive note)! Thank you for sharing your world with us! Happy tears! I woke up my dog, “look, look, a new Charlie book! ” So glad you are doing this! Thank you! Yes, I teared up….the music, images and years of memories are touching! So looking forward to this book! Been following Charlie and your blog since day 1…already pre-ordered….cannot wait for the book to come out!!!! I loved the video & did get tears in my eyes watching Charlie grow. The photography is beautiful. I’ve ordered the book & look forward to it. 10 Years is really something to celebrate! Happy birthday to Charlie! Ordered a personalized copy for me and Ramses. 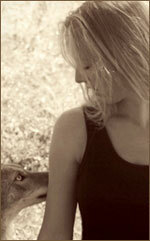 He is my little coyote dog, so much like Charlie only all black, a little shadow of the wild. Getting very gray now as he’s 13. I keep watching Charlie’s video… I start to choke up every time the screen first shows: CHARLIE and then you have the pic of him throwing his colorful toy in the air… tears truly flow when the final pics are shown: Chole, Eli and Shreve!!! What a gift all y’all are! K ~ I’m so happy you keep watching the video! Thank you…. Dear Shreve, I discovered you & Charlie at a small second-hand bookstore in St. Augustine, FL, many years ago. 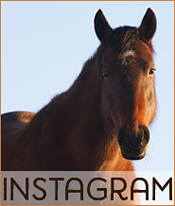 I have followed Charlie and your Farmily through your posts and photographs with so much pleasure. By some quirk of fate, Leonidas, my beautiful white swiss shepherd came into my life in 2008; a mess abandoned by his owner to the local shelter in 2008; 11 months old, no training and wild with energy. He also was born in 2007 and in your photos of Charlie I often found a glimpse of my own Leo; the mischievous expression, or a thoughtful gaze; that always gorgeous face. Leonidas’ back gave out this Spring and I had to put him down. It killed me. My lion-hearted boy. So i purchased your book in his honor. Leonidas, always in my heart. Long may you run. Check out this post for a straightforward and inexpensive answer.